Amanda Gaspard, who grew up in New Hampshire, was wounded in the deadly shooting in San Bernadino, California. Her parents flew across the country to be with her, and Friday, her father spoke with necn. The 31-year-old is one of the survivors of this week's mass shooting, but she was badly hurt. "It is difficult to know what was a direct hit ... and what was ricocheted shrapnel," said Ken Gaspard. "She has two different entry points in her thigh, and then she also has a pretty severe injury to her knee. A bullet has also been removed from her wrist. While the physical injuries will heal, it's the emotional wounds that could be harder to overcome. "She's emotionally processing just the sheer carnage that she experienced and the loss of so many people who were very dear to her," said Gaspard. 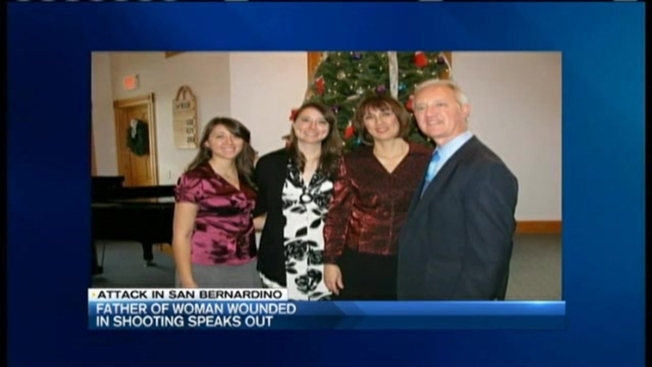 Amanda Gaspard, who spent most of her childhood in Hinsdale, New Hampshire, is an education specialist with the San Bernardino Health Department and helped organize the holiday function where the attack took place. Thursday night, she found out the names of her co-workers who did not survive. "It was just a very difficult thing for her to hear the names of the people that she had personally trained, others who had worked closely with her, it was just very disheartening," said Ken Gaspard. Amanda Gaspard told her parents the shooter stood right above her and could have killed her with a bullet to the head, but, for some reason, aimed toward her leg. "We don't believe that God says 'Oh, take this one, don't take that one,' but we do believe that Providence intervenes at times," said Ken Gaspard. "For some unknown reason, her life was spared." Amanda Gaspard has a master's degree in public health and has trained for active shooter incidents. Her father says she wants people to know how well all of the first responders at the scene and at the hospital handled the frightening situation. "She thinks that more lives would have been lost had there not been the response that there was," he said. Her parents think she'll be discharged from the hospital soon, but then she'll have to undergo several months of rehab. They hope she may be able to be in New Hampshire for Christmas.